Electronic gadgets that don’t require charging are a step closer after the successful demonstration of a nanoscale generator that produces enough electricity from mechanical movement to power a LCD display. Device inventor Zhong Lin Wang, from Georgia Tech, explained that the mechanical energy needed to drive the generator could come from a heartbeat, the pounding of a shoe on a footpath, the rustling of a shirt, or the vibration of a heavy machine. Wang’s nanogenerators rely on the piezoelectric effect seen in crystalline materials such as zinc oxide, in which an electric charge potential is created when structures made from the material are flexed or compressed. By capturing and combining the charges from millions of these nanoscale zinc oxide wires, Wang and his research team can produce as much as three volts at currents of up to 300 nanoamps. The earliest zinc oxide nanogenerators used arrays of nanowires grown on a rigid substrate and topped with a metal electrode. Later versions embedded both ends of the nanowires in polymer and produced power by simple flexing. 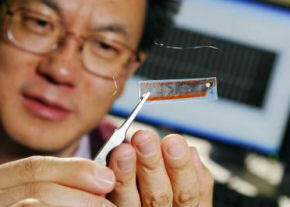 Regardless of the configuration, the devices required careful “growth” of the nanowire arrays and painstaking assembly. The latest device, however, uses a much simpler fabrication technique. First, the research team grew arrays of a new type of nanowire that has a conical shape. These wires were cut from their growth substrate and placed into an alcohol solution. When flexed, these nanowire sandwiches – which are about two centimeters by 1.5 centimeters – generated enough power to drive a commercial display borrowed from a pocket calculator.